Spotify is the perfect example of a large agile company. This is a case study of good managerial practices. In 8 years, their workforce has grown to 1,500 employees and the company has maintained its drive and ability to innovate. The fact their employees are so open to change means that it is perfectly adapted to an ever-changing market. Spotify is proof that agile start-up management can be applied to large companies. Spotify‘s challenge was to find a way to produce on a larger scale, without losing agility. They have obviously succeeded. Here is a video published by Spotify, in which Henrik Kniberg explains the organizational model of their production teams. This article explains the most important principles. Kniberg, Agile/Lean coach at Spotify and Lego, recommends organizing into small teams called squads. They are composed of 4 to 6 people, which makes it possible to be more innovative and to act quickly. A squad is responsible for the development of a project from A to Z. A squad develops, tests and deploys its solutions autonomously and is not required to submit its decisions to management. Autonomy makes it possible to free employees from hierarchical rigidities and above all to motivate employees. The squad decides what it needs to develop to address a problem, how to develop it and act quickly accordingly. In exchange for autonomy, squad objectives must be aligned with the company’s strategy, but also other squads’ priorities and objectives. Kniberg illustrates this need for alignment by comparing it to an orchestra where each musician is autonomous and plays his instrument but listens to others to create a worthy piece. Autonomy and alignment should therefore not be seen as the two extremes of the same scale, but as two dimensions: the more important the alignment, the more we can allow the different squads to be autonomous. The squads are then divided into “tribes” according to the project they are working on. 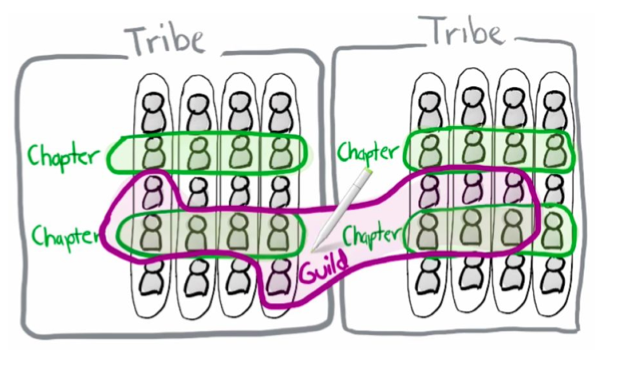 Within a tribe, “chapters” are made up of people with the same skills or functions. A chapter has a coach who encourages the squad to progress and share best practices. Chapters meet regularly to discuss the problems they are facing in their particular area of expertise and the solutions they can provide. In terms of skills, this organization gives employees more flexibility to move from squad to squad without ever changing coach. In addition, it allows the company to achieve economy of scale. On the other hand, “guilds” bring together people who share the same interests. Guilds organize conferences around topics of interest, hold a weekly newsletter and everyone is free to create, join or leave a guild at any time during their life in the company. Here is an example: you are a data analyst in charge of implementing a DataViz solution. So, you enter a squad with complementary profiles that will take care of this project. In this squad, you join the tribe in charge of the company’s digital transformation which has several squads with projects similar to yours. In order to keep your skills up to date and exchange knowledge, you belong to a chapter made up of other data analysts. In addition, a coach follows you and advises you whenever you need it. Finally, you belong to a guild that deals with agile Project Management. This allows you to bring another dimension to your skills and makes you feel even more valued in your squad. Chapters and guilds allow Spotify to create a community and corporate culture despite the autonomy granted to squads and the highly volatile nature of the structure. Autonomy makes it possible here to free oneself from hierarchical rigidities and above all to motivate employees. Beyond culture, Spotify’s vision is to improve operational efficiency, which is very clearly reflected in the way we launch production of new products or new features. Spotify’s goal is to make it very easy to create new features and to do them as frequently as possible. For example, they have completely changed the application’s structure to allow each squad to update the functionalities for which it is responsible without consulting other teams. A squad belongs to one of three categories: functionality, client application or infrastructure. The functional squads, for example, are responsible for developing the search or recommendation engine. Applications squads are specialized in one of the Web, Mobile or Desktop platforms. The architecture squads develop the tools and methods that the first two categories need to work, such as A/B testing. The strength of Spotify’s culture is its agility. The adaptability of employees to a constantly changing market makes it a powerful and innovative structure. Spotify has become a case study in good horizontal management and remains an example to follow for a large number of companies! Charles Miglietti, President of Toucan Toco.